Work is progressing under a development agreement that will give residents access to world-class leisure facilities on their doorstep in the future signed by Basingstoke and Deane Borough Council and NewRiver REIT Plc. What does the transformation involve? What stage has the project reached? Why was this decided as a way forward for the park? When could the development start? The council signed a development agreement with NewRiver REIT Plc for a major project to revitalise Basingstoke Leisure Park. This will transform the leisure park, creating 500,000 sq ft of new leisure activities and experiences. Doubling of the size of the existing leisure facilities, the greatly expanded park will operate along side a 200,00 sq ft designer outlet village, creating an exciting new leisure destination. NewRiver's £300 million proposed investment is a vote of confidence for Basingstoke, requiring no public funding to deliver the development. It will include a modern £23 million replacement for the council's popular Aquadrome, also funded by NewRiver. The existing Aquadrome will remain open during the construction phase until the replacement opens its doors. The development will create an attractive destination of choice for the South of England contributing to the long-term vision of Basingstoke as a premier town in the region. Extensive work on a planning application for the site has been progressing, including detailed studies and wider technical work. Discussions are beginning with existing operators about future plans and NewRiver will start working with potential occupiers to bring new attractions to Basingstoke. Early concepts draw inspiration from leading global leisure destinations which provide innovative leisure experiences for families, high adrenaline pursuits and state of the art virtual reality e-sports. Long term options will also be explored for a new ice rink. The current leisure park is getting to the point of needing redevelopment. Through this exciting and innovative national-scale project we can continue to give our residents access to ‘best in class’ leisure facilities in the future. This is an innovative way of delivering a comprehensive renewal of the leisure park without putting the burden on taxpayers to fund it or depending on all operators at the park investing millions in upgrading their facilities on a piecemeal basis. 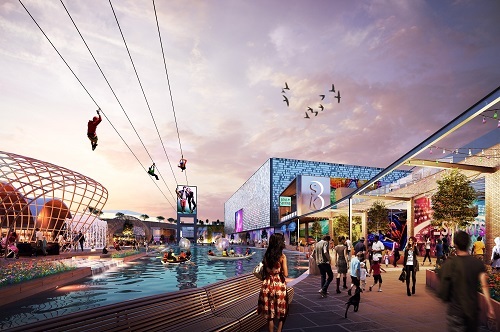 The new leisure park will strengthen Basingstoke’s appeal to a much wider catchment area, keeping the spending in the town from some of the borough’s shoppers and visitors who currently don’t come to Basingstoke to meet their leisure and shopping needs. The development would bring significant benefits to the borough in terms of the increased rents and business rates, new jobs, a boost for the local construction industry and attract new income into the local economy. The designer outlet village, an offer currently unavailable without travelling a considerable distance from Basingstoke, will focus on aspirational brands at affordable prices. It will complement the town centre’s existing retail offer. A development of this scale is a highly complex project that would be delivered in carefully planned phases. It is estimated that work would begin on the new leisure park from 2023, subject to planning permission.